Employees are a key resource, and the following are our top tips when considering employment of any staff in any business. 1. Make someone responsible for HR whether it is yourself or an expert manager, get them well trained and have available to them expert advice so they can take responsibility for staff and ensure there are clear lines of responsibility. 2. Contracts, handbooks and policies and procedures. Please make sure that these are well drafted by expert solicitors to set out clearly the areas of responsibilities, all duties, hours and restrictions that are necessary to protect the business. 3. Incentives. What are you doing to motivate staff through pay, bonuses, promotions, access to equipment or additional staffing? Be clear and be honest. 5. Access to legal advice. 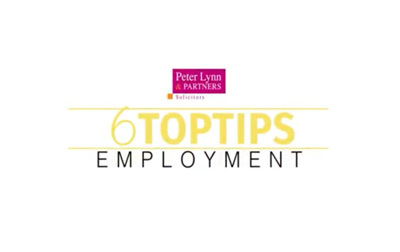 Please ensure you have on hand quick and easy access to expert advice from an expert employment lawyer, ideally on the end of a telephone for those urgent enquiries. 6. Insurance. Have an insurance product that covers, not only the cost of advice but possibly also Tribunal costs and even Tribunal awards and settlements. If you are employing anyone in business, you need bespoke expert advice from expert commercial/employment lawyers. Call Stuart Atherton on 01792 450010 or email [email protected] to arrange a free initial meeting. Peter Lynn & Partners – Preventing Legal Problems.